Palo Alto University (PAU) congratulates James Otieno, Chair of PAU’s Board of Trustees, on receiving the Dan L. King Award for College and University Trustee Leadership from the American Association of University Administrators (AAUA). The AAUA develops and advances superior standards for the profession of higher education administration. This award is given annually to a college or university board member whose service exemplifies commitment to higher education and who demonstrates the highest ethical standards in providing leadership from the tress-level. This is a new award, and James Otieno is the first person to be awarded this honor. 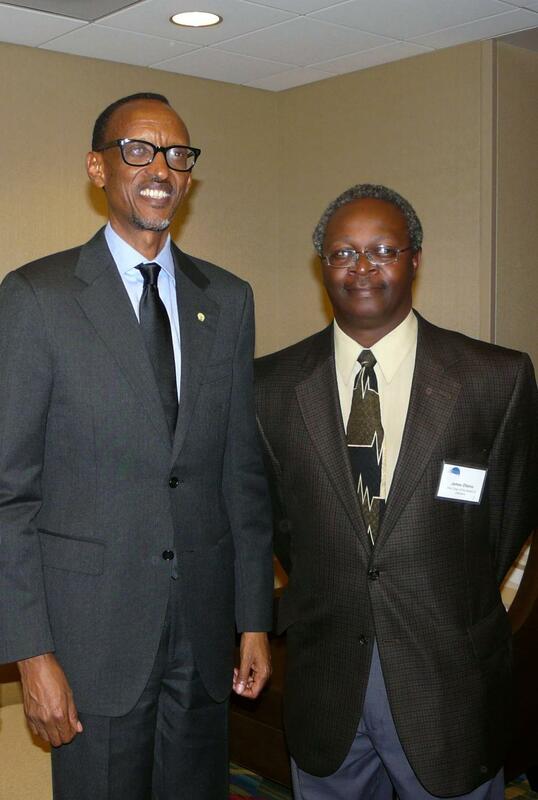 James Otieno (pictured, right with Rwandan President Paul Kagame) has chaired PAU’s board for five years, and has been a trustee since 1996. Over his time here, he has done a great deal to help PAU and PAU students to thrive. He has pushed to keep tuition costs stable for PAU students, supported a focus on diversity in PAU culture, and has helped grow in community and international scope. The PAU community congratulates James on receiving this prestigious and well-deserved award.